They’re milling around like dogs, sniffing out each other’s credentials, ranking them on a scale of business relevance. Apparently I’ve established my commercial value at the registration desk, as I stand alone, watching the speaker, cool, ice-blond, elegant, drifting gracefully between enclaves. A bell rings, the speaker vanishes, delegates shuffle towards the auditorium. In the adjacent cloakroom cubicle, someone is painfully, vocally retching. When the speaker emerges, we exchange furtive glances at the basins. She takes one and leaves. Later, mingling again, she cuts me dead. Wrong credentials, wrong place, wrong time. This photo reminded me of a million conferences (hyperbole, moi?) that I must have attended throughout my career. Never an enthusiastic networker, how I hated that stage of the proceedings. 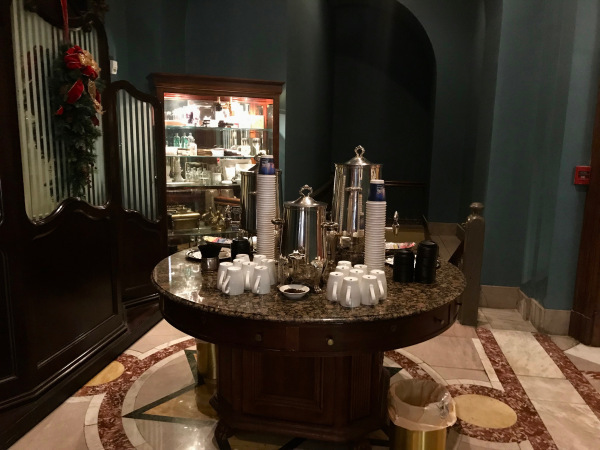 Thanks again to someone who is positively relishing her second career, Rochelle Wisoff-Fields, our esteemed leader, who still finds the time for Friday Fictioneers. This entry was posted in Friday Fictioneers, Just Sayin'. Bookmark the permalink. I felt the MC’s pain. On the outside looking in. Brilliant is the word I give to your first line. I can just imagine them sniffing each others…um…credentials. Brava! So much in so little, how we despise the speaker! Yes, some people hate for others to witness a weak moment Thanks for reading, CE. Excellent tension and atmosphere in this piece. I love the first line. That’s how it goes! First impression followed by a quick relevance ranking! She can’t allow anyone to see behind that confident exterior. Many of us do the same everyday. A shame he was the one to catch that glimpse. Sadly so. Thanks for reading, Iain. And that’s how it goes for some, isn’t it? Look down on those “beneath” your station, even when they have shown you a kindness. A defence mechanism perhaps, but still unkind.Thanks for reading, Dale. Very well done. Like a lot of others, I love that first line. I think it sums up some business conferences quite well. Such elegant writing, Sandra, and such dry wit. I loved it! Reading this was like watching a little vignette of the way it works in business. Clearly, the caste system exists everywhere. It must be even worse in politics. 😦 Thanks for reading. ouch – could feel the sting. Having seen the weakness in someone else is rarely a good thing… I’m glad not to have to attend to that type of conferences. Yes, sometimes it’s almost better to pass by on the other side, for all the good it does when you try to help. But still you try. Ive been to conferences like that, i’m only here for the tea and biscuits, oh and lunch and a bit of a grumble! No one seems to want to own up to their own embarrassment,or shared humanity, in a world based on how many letters are after your name. You’d expect the “speaker” to show some humanity after being given a peppermint and kindness. Alas, it’s still cutthroat. Love *the sniffing of credentials*. Yes, that tickled my imagination. 🙂 Thaks Sascha. Indeed it is. Thanks for reading. To some we are all just blips on their peripheral vision. So true. And some not even that. Thanks for reading. Excellent – and a true indictment of business values. Yup. I’m amazed so many people recognise the scenario. Guess not. Thanks for reading. Ah yes, we’ve all met someone like that. They should be avoided, even in mint condition. Wonderfully done. A pity your MC lacks the credentials and a pity the speaker takes but never gives. A sad indictment of the world some inhabit. Indeed it is. Thanks for reading, Sarah Ann. You have painted a vivid word picture of everything that is wrong in that kind of skewed values world. An accurate and biting portrayal of these horrendous events, and like everyone else I love that opening line – brilliant! Thanks Ellie, glad you liked it. Been there, done that too many times. You painted it almost too well, nicely done. Thank you! It did feel a bit like first day at school, didn’t it? When you used to wonder how everybody seemed to know someone else, apart from you. Always being on the outside looking in is an incredibly hard place to be. Especially when you know you’ve got what it takes! You captured that a so much more in your story. Your story sums up the reasons I decline to attend conferences whenever possible. You touched a nerve. Excellent piece, Sandra. I’ve been there a few hundred times myself. I never was much good at “small talk” or mingling–plus, my credentials weren’t very impressive either. They say children are cruel.